The modeling of a landscape environment is a cognitive activity that requires appropriate spatial representations. The research presented in this paper introduces a structural and semantic categorization of a landscape view based on panoramic photographs that act as a substitute of a given natural environment. Verbal descriptions of a landscape scene provide the modeling input of our approach. This structure-based model identifies the spatial, relational, and semantic constructs that emerge from these descriptions. Concepts in the environment are qualified according to a semantic classification, their proximity and direction to the observer, and the spatial relations that qualify them. 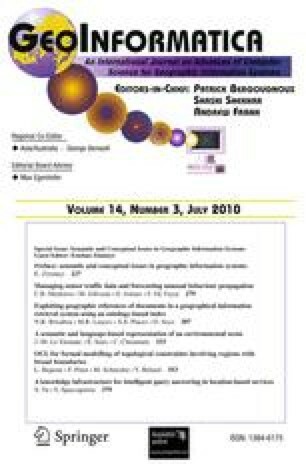 The resulting model is represented in a way that constitutes a modeling support for the study of environmental scenes, and a contribution for further research oriented to the mapping of a verbal description onto a geographical information system-based representation. The authors gratefully thank the anonymous reviewers for their helpful comments, and Alcino Ferreira for his careful language reviewing and comments.